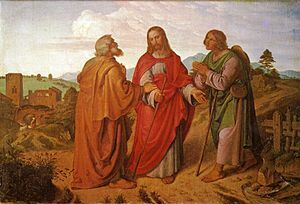 The story of what happened to the disciples Cleopas and an unnamed other on the road to Emmaus in Luke’s Gospel is quite a famous one. The scene is just after the crucifixion – Jesus has, apparently, died. His followers are bereft, and they don’t know what to do. Verse 17 says they were “downcast” – a word meaning dejected, sad, discouraged. It is the worst of times for them. They had hoped that Jesus would lead a revolution, overthrow the oppressor, make everything right in the land. Now he is dead, killed by the state in front of everyone, a demeaning and disgraceful death. Cleopas and friend are walking to Emmaus, a village seven miles from Jerusalem. As they go they are talking about what has happened, trying to make sense of everything that has gone on in the past few days. I can’t know exactly how they felt, but I can sense something similar – when I have lost someone, when someone has died or left me; when I am feeling alone and hopeless and don’t know where to turn. Where I want someone to tell me what I should be doing and what is going on because I do not understand and I want someone to make sense of the world. I think this is similar to what they felt – their leader had gone, their friend. The amazing man who could do wonderful things and taught such fantastic truths had, inexplicably, gone. Sometimes I think that when I am depressed I am like those disciples – I have lost sight of Jesus, I am hopeless and alone in the face of dark emotion. It is at this point, in the darkness of bereavement, that Jesus comes to his disciples. The Bible says that “Jesus himself came up and walked along with them” (Luke 24:15b) That has been my experience – in some of my very darkest moments I have felt closer to God. Sometimes, when I am past the ‘rage against the dying of the light’, past the “why? !” and am in that deep still blackness, where there is nothing, I am nothing, when I feel with Job that “Naked came I out of my mother’s womb, and naked shall I return thither: the LORD gave, and the LORD hath taken away.” In that state, somehow there is an acceptance, an ability for me to also say with Job the last part of that verse: “blessed be the name of the LORD.” (Job 1:21 KJV)* What I’m trying to say is that I find a sort of meeting place with God amidst the awfulness. I think it is because the illness strips me of ego, of anything that might get between me and God. It makes me confront myself as a sinner in need of grace (although with the caveat that when I am severely depressed I find it rather hard to believe that I have received grace.) As with the disciples on the road to Emmaus, Jesus comes to me and meets me at my darkest point, after I thought he had left me forever. They didn’t know it was Jesus who came to them, the Bible says “they were kept from recognising him.” (v16). Their eyes were shut – and perhaps mine are too, and I do not take notice of all the people who have helped me in my dark times, of all the people who have done Christ’s work for me, and I have not noticed. In the words of the phrase, “Christ has no hands but yours” – what we do for others is both what we do for Christ himself (Matthew 25:31-46) and how we show Christ to the world. Jesus listens to his two disciples as they tell him his own story. He listens to us, every prayer, nothing we say is ignored or batted aside, even when we are wrong about things, even when we misunderstand. Christ is the great listener, and I know how much listening is a valuable tool when I am mentally ill.
Then he changes their thinking. He tells them, shows them everything they should know using the tools they would understand best – he explains from the Bible what it says about himself. So too can the Bible give new understanding to our lives, and change our perceptions of what is happening in our lives. I believe Jesus speaks strongly to us through the words of the Bible, and while I wouldn’t say it gives direct instructions for everything, it does for every emotion, every major element of our lives (but it doesn’t, for instance, tell you how to use a washing machine!) Jesus changes us – sometimes we don’t even realise it is happening. Sometimes there is a confrontation, as there is here with the disciples, where wrong thinking is challenged and changed, either through God speaking to us directly or through his ministers on earth (that is to say, other Christians.) At other times Jesus changes us in more subtle ways, directing us toward different thoughts, different paths, gently ushering us into a new reality. We gradually become well, we gradually learn what it is that triggers our illnesses, we learn each time and there is change over time. I see that as Jesus working in me, although there are times when I would love a bells-and-whistles sort of experience! Jesus stayed with them, broke bread with them and then they knew who he was. We meet Christ in communion, whatever position you take on what happens in communion, it at least represents the people of God come together to share in God, in his presence, in remembrance of him and of his actions in our lives. Like Wright above, I see in this passage Jesus as a counsellor, as someone who works with us in our problems and offers a solution. I see it as a model – to meet people in crisis, to listen, to challenge views (with evidence) and then to leave the person when they are able to cope on their own. I see Jesus at work in my own life, through those who counsel me, through the people I love, and through his direct action in my life, particularly through prayer. Christ is present in our darkest days, and with us for the journey. I deeply believe that truth. *I tend to revert to using the KJV in distress. I’m not sure why. Berkley, J. D. (1989). Vol. 18: Called into crisis: The nine greatest challenges of pastoral care. The Leadership Library (40). Carol Stream, IL; Dallas, TX: Christianity Today; Word Books.